Six-year-old Lucia St. Lorenzo wondered how police working the holiday would get their Thanksgiving meal. So, to make sure officers in Newtown got to celebrate Thanksgiving just like everyone else, she went out of her way to bring it to them herself. “Some police officers were working and they don't get to stay home with their families,” said 6-year-old St. Lorenzo. Lucia and her father, Antonio St. Lorenzo, delivered the catered feast to the police station Thursday night. Originally Lucia offered to pay for the whole dinner herself with the money she had gotten for her birthday, but restaurant owners from the Newtown Inn agreed to donate the dinners for 8 officers to support Lucia’s act of kindness. Linda Antignani, who’s behind the Newtown Adopt-a-Cop program, also helped Lucia and her father make the night happen. 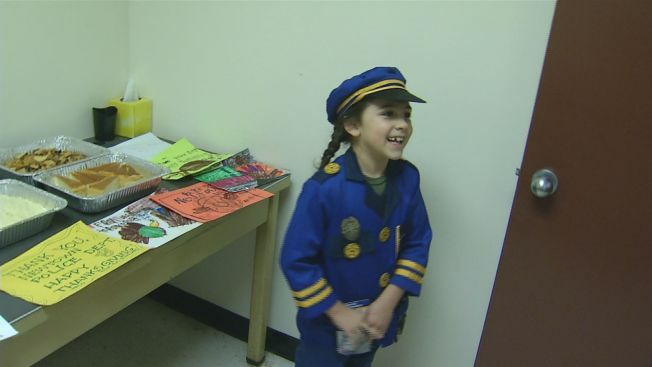 “It falls in that category of a little girl knowing that the officers would be alone on a holiday and wanting to give them a little piece of home,” said Linda Antignani. Lucia's father, says he's so proud to see his daughter follow in his footsteps. He spend this life giving back to homeless veterans and other causes. “It really makes me feel proud that she's got that kind of heart. That it's not all about her. She gets. It's about giving back,” said Antonio St. Lorenzo. Lucia, a Head O'Meadow student, said she wanted to thank Newtown's finest for keeping a close eye on her school and on the town. “They are outside my school so nobody comes in and hurts the kids,” said Lucia. Newtown officers told NBC Connecticut the gesture gives them a little slice of home on this holiday. It also reminds them of the special bond they have with the community.